Bought a new space heater for my studio yesterday as my old one had crapped out. Hadn’t needed it of late as it’s been warm and spring-like here, however, yesterday all the stormy weather brought some cool temps back to North Alabama. So, I brought out the new heater and turned it on to see how well it would work. 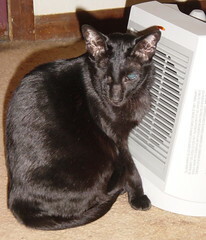 I no sooner turned back around and there was Susu, my little oriental shorthair girl, right up against it. I mean, if I had started to smell burnt cat hair I wouldn’t have been surprised!! Global warming?? My cats say bring it on! Foo dog tattoo sleeve, FINISHED!! Uploaded pictures from the last two touchup sessions on my foo dog tattoo sleeve. 2 weeks ago, we had a 3 hour touchup session, that basically went over nearly everything….the blues of the peonies, the darks of the mane and tail and background, did some whites of the spots on the foo dog body as well as highlights of white on the swirls of the mane and tail. Last night, did one last little session, just went into the whites again, and a bit of the light blue over my wrist bone (ow!). But, it’s finished!! I will so miss Shayna…I have been working with her for nearly 2 years, first on my tiger sleeve on my right arm, then the foo dog on my left. Lots of hours spent together, and we have become quite good friends. She leaves Huntsville next week to open a tattoo shop with her boyfriend in North Carolina. I wish her the very best, but will miss her. I hope we can stay in touch. The whole thing just leaves a lump in my throat. Another Nibblefest painting on Ebay! Here’s my last entry for auction for the Nibblefest Ebay art contest, theme this month, “asian inspired”. 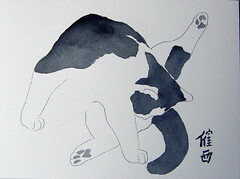 I love doing chinese brushwork ink paintings of cats, and this is definitely asian-inspired, with a twist! A portrait of a cat doing the groom….based on my rescue cat Kesey. 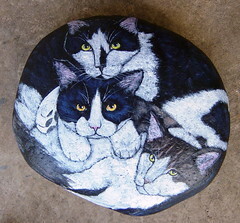 This would be a good pairing with my other cat ink painting for auction on Ebay right now, check them out! But, you have to get in there quick for this one, as it’s only a 3 DAY AUCTION! One of my entries in the Ebay Nibblefest art contest. This is a themed contest that runs each month starting on the 20th and ending on the 27th, each piece of art starting at a no reserve price of $.99! Now how great is that?? This month’s theme is Asian Inspired. 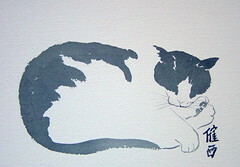 This piece is a chinese brushwork painting of a favorite subject of mine, a sleeping cat. This one based on my cat Alice. This is hand-ground chinese ink 9×12 Arches 300# watercolor paper. 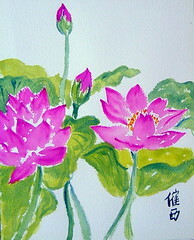 This first piece is a chinese brushwork painting of lotus flowers, watercolors on 8×10 Arches 300# watercolor paper. 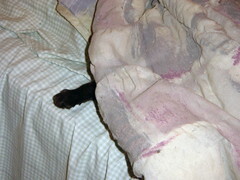 My rescue siamese Dashiel likes to burrow under the covers and sleep, I caught this shot of just his paw sticking out last night, lol. 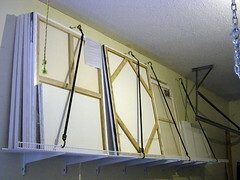 Yesterday Bil hung some shelving in the garage to house some of my larger canvases, 30×40’s and whatnot…so glad to get these up and out of the way! And, now that they aren’t languishing in packing boxes behind and under things, I can get at them a bit easier and know what I have as well. You are currently browsing the TagsCats Art Weblog blog archives for March, 2009.